Last week’s election showed that people in the U.S. want a more democratic government, free of corporate control. A record number of people showed up to vote out corporate power and vote in justice, equity, and corporate accountability. Despite the gains made, there’s no doubt that corporate-backed powers, and allies in the Trump administration, will continue assaulting democracy, human rights, public health, and the environment. The size, scale, and speed of the corporate takeover of our democracy under Trump is unprecedented, as is his blatant use of xenophobia, racism, and misogyny to advance his agenda. But for decades, corporations have been attempting to seize control of our democracy and threatening lives in their drive for profit. And for decades, people like you have joined Corporate Accountability to push back — and win. Will you join us today? There is so much at stake right now — your support is crucial. You have the chance to double your impact during our 2018 Matching Gift Challenge — where up to $100,000 will be matched by a small group of donors. 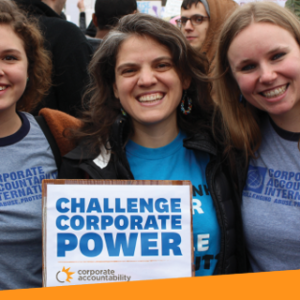 Your partnership with Corporate Accountability fuels campaigns that compel transnational corporations to stop destroying our health, human rights, democracy, and the planet. You advanced climate justice. Your support helped us organize with governments and allies around the world to forge a path forward to kick Big Polluters out of the international climate talks. You defended the human right to water. Thanks to the organizing you’ve made possible, Veolia, the world’s largest water privatizer, announced that it’s ending its top scheme for taking control of public water systems across the U.S.
You protected children’s health by supporting a precedent-setting victory to end McDonald’s McTeacher’s Nights. Teachers in California passed a statewide resolution demanding an end to this exploitative, predatory marketing practice disguised as a fundraiser. Corporations like Exxon, Nestlé, and Koch Industries have vast amounts of money. But no force is more powerful than people, united. Together, with you by our side, we will continue to activate people power and achieve strategic victories in 2019 to challenge and change destructive corporate actions at every level. Remember, through December 31, every gift we receive will be matched dollar-for-dollar, up to $100,000, by a small group of donors who wants to fuel this growing movement. Will you help us meet this challenge?